3 bedrooms 2 bathrooms and a pullout in the main living room. 1 fireplace, eat in kitchen with very large sun room. double wide mobile home. Limited access to a Caribbean style beach with shallow depth for first 400 feet, usually warmer than the main lake. Certificate of clean water from the well just so the water is now drinkable. Also Air conditionning unit just installed so the house maintains its comfort in all season. 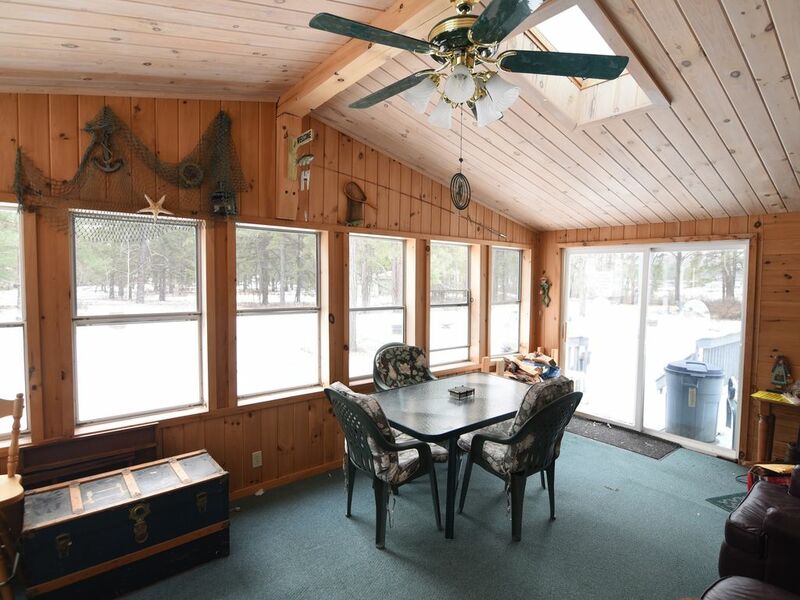 Nice outside deck and sun room provides wonderful view of three sides of property. No neighbors within view. Canoe available for relaxing paddles on the pond in front or if you are adventurous you can take it down to the beach. (Life preservers and paddles provided). Usually during the winter months I need two to three weeks notice for any reservation. This is not a fancy place, but has everything you really need. Plus a nice deck, a fire pit, and a close walk to Lake Champlain. Very quiet and peaceful. The owner was extremely responsive -- a water problem happened shortly after we arrived, and he resolved the problem diligently and as quickly as possible. Problems with houses do happen! But his responsiveness ultimately made it no problem for us. Great location near the lake, easy to reach from main roads. We enjoyed our stay at this property. Our grandchildren appreciated the many toys available to them. The adults appreciated help provided by Bruce to a mini-crisis. His calm thoughtfulness was just what we needed. Only criticism is the wi-fi. It basically did not function during the visit. Not good for the business people that need to stay in touch. This was a great stay. The owner is awesome and the place is perfect!